We'll deliver and spread mulch in your garden beds. Are you looking for an inexpensive way to restore the beauty and uniformity back to your overgrown garden beds? Spreading mulch in your garden beds and landscaped areas is an important part of maintaining a healthy property. Mulch provides many benefits for your garden such as a nice uniform look and it keeps it free of weeds. Mulch helps to control weeds, retains soil moisture, and even acts as an insulating blanket for your soil during the fall and winter months. There are several different types of mulch that can be used on your property for different aesthetic and functional properties. Irreco LLC is a full service garden and landscape contractor based in St. Louis, MO. We specialize in the delivery and spreading of several different types of mulch for gardens and landscapes of all sizes. We can deliver and spread mulch throughout your garden beds, flower beds, and landscape features for both residential and commercial clients. Mulch is sold and delivered by the yard. 1 yard of mulch spread about an 1″ thick should cover approximately 324 square feet. We can arrive to your location with approximately 4-5 yards of mulch in our dumping trailer and orders larger than that will need to be delivered via a dump truck. Our mulching estimates include delivery costs, spreading (1 hr per yard) and a clean up of the delivery area. Preparation Of Beds: Prior to spreading mulch in your old garden beds they should be weeded and cleared out of any brush or debris. Landscape cloth can be laid down if necessary. Shrubs and surrounding tree cover should be trimmed back to prevent the organic debris from falling in your garden. We can add garden bed preparation and clean up into your estimate. If you just want mulch delivered to install on your own you should contact your nearest landscape supply company and inquire about mulch delivery. There is more to mulching then just spreading it out on the soil. You need to know about the types of mulch, their benefits and when they are appropriate to use. We have a great growing season here in St. Louis but we still get cold, wet winters that can be hard on unprotected gardens and landscaping. Mulching your garden beds will help protect them, in addition to making the look great. We will work with you to determine the type of mulch you’d like spread. We show up on the scheduled day of delivery and spread your mulch as promised. The end result is garden beds and landscaping with a clean, uniform appearance. The final cost of delivering and spreading mulch in your garden(s) will be determined by the size of the garden beds and how much mulch we’re going to need to deliver and spread. The type of mulch you choose will also affect the price and lastly the most expensive portion is the labor to install and spread the mulch. This usually means hand loading and dumping wheelbarrows full of mulch and spreading it in your garden beds. If we can dump the mulch close to your garden beds for minimal handling then we’re going to be able to complete your job faster. If we need to move the mulch with a wheelbarrow or a skid-steer over a longer distance (from the front to back of your home for example) then the cost of your labor will go up because we’re spending more time. Why Choose Irreco To Install Mulch In Your Garden Beds? We understand that you have many landscaping companies to choose from throughout St. Louis. We just want you to know that when you choose to work with Irreco you are partnering with a small, locally owned business that has many years experience keeping St. Louis properties looking their best. You can expect knowledgeable, reliable gardening services from a company that cares about your properties appearance and our local reputation. 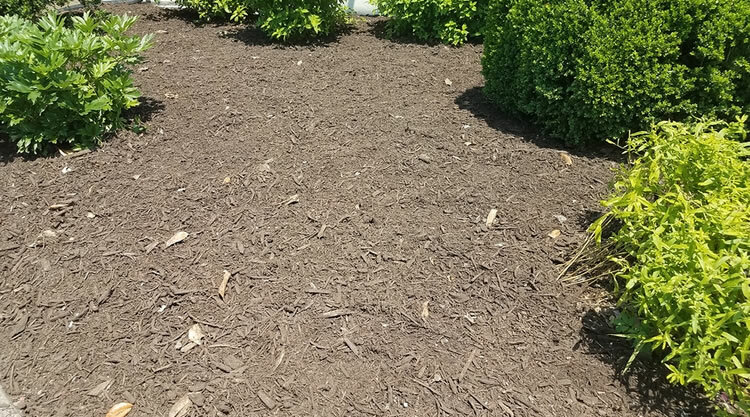 When we spread and deliver mulch you can expect a great looking job, we’ll get the mulch into every crack and crevice that it should be including underneath your shrubs and other low lying bushes that other landscapers often ignore. When we’re done we are going to do a thorough clean up of your job site so you’ll never even know we were there. It’s these little details that make a big difference in the quality of our service!